Finding an answer to the faint sun paradox: Carbonyl Sulphide? | Watts Up With That? Finding an answer to the faint sun paradox: Carbonyl Sulphide? First, read a primer on the Faint Sun Paradox here Normally, I wouldn’t use Wiki, but the article does include a reference to Nir Shaviv. This compound is found to catalyze the formation of peptides from amino acids. This finding is an extension of the Miller-Urey experiment and it is suggested that carbonyl sulfide played a significant role in the origin of life. – “The young sun was approximately 30 percent weaker than it is now, and the only way to prevent earth from turning into a massive snowball was a healthy helping of greenhouse gas,” Associate Professor Matthew S. Johnson of the Department of Chemistry explains. And he has found the most likely candidate for an archean atmospheric blanket. Carbonyl Sulphide: A product of the sulphur disgorged during millennia of volcanic activity. – “Carbonyl Sulphide is and was the perfect greenhouse gas. Much better than Carbon Dioxide. We estimate that a blanket of Carbonyl Sulphide would have provided about 30 percent extra energy to the surface of the planet. And that would have compensated for what was lacking from the sun”, says Professor Johnson. To discover what could have helped the faint young sun warm early earth, Professor Johnson and his colleagues in Tokyo examined the ratio of sulphur isotopes in ancient rocks. And what they saw was a strange signal; A mix of isotopes that couldn’t very well have come from geological processes. – “There is really no process in the rocky mantle of earth that would explain this distribution of isotopes. You would need something happening in the atmosphere,” says Johnson. The question was what. Painstaking experimentation helped them find a likely atmospheric process. By irradiating sulphur dioxide with different wavelengths of sunlight, they observed that sunlight passing through Carbonyl Sulphide gave them the wavelengths that produced the weird isotope mix. – “Shielding by Carbonyl Sulphide is really a pretty obvious candidate once you think about it, but until we looked, everyone had missed it,” says Professor Johnson, and he continues. – “What we found is really an archaic analogue to the current ozone layer. A layer that protects us from ultraviolet radiation. But unlike ozone, Carbonyl Sulphide would also have kept the planet warm. The only problem is: It didn’t stay warm”. – “Our research indicates that the distribution and composition of atmospheric gasses swung the planet from a state of life supporting warmth to a planet-wide ice-age spanning millions of years. I can think of no better reason to be extremely cautious about the amounts of greenhouse gasses we are currently emitting to the atmosphere”. August 19, 2009 in Climate_change, Earth, Paleoclimatology, Science. ← Hovmollering the SST: T-shirt tie-dye design or climate science? models eh? Laboratory experiments (which simulate prehistoric earth? )… It just keeps getting better. I’m sorry, I just couldn’t resist! We estimate that a blanket of Carbonyl Sulphide would have provided about 30 percent extra energy to the surface of the planet. They should have said “retained” since the chemical itself does not add energy, but reflects more LWIR with increasing concentrations. What is missing is how much of that OCS is converted to H2SO4 and thus all of the aftereffects that causes. How much was precipitated out as rain? Modeling an ancient atmosphere when you aren’t sure of its total makeup is even more dicey than modeling our existing one. Or ‘re-radiated’ perhaps… I think they did mean that the LW energy is ‘trapped’ as the consensus GHG theory says, at first glance it does appear rather dodgy though. “weird isotope mix” doesn’t sound too good either. Not only that, but no reference is made to the chemistry of the oceans which could have impacted the processes. This is an amazing extrapolation to go from random chemical reactions based on the four forces of nature to encoded recursive self reproducing life using photosynthesis! Well, at least it goes up and down at the right times: I’m convinced that orbit perturbations influence ice ages, but the ice ages themselves seem to come “too fast” to, and with too great a change over too short a time to be completely explained by the very, very slow changes in orbit axis, inclination, perturbations -> and thus total solar radiation received to account for the swings in temperature required. Tipping points then? But what “tips” to cause 4000 feet of ice to cover Indiana, Illinois, and all of North and South Dakota, Michigan, Minnesota, and most of Canada? By the way, how come we never seen ice age charts of Africa and Australian glaciers? Rondanelli, R. & R.S. 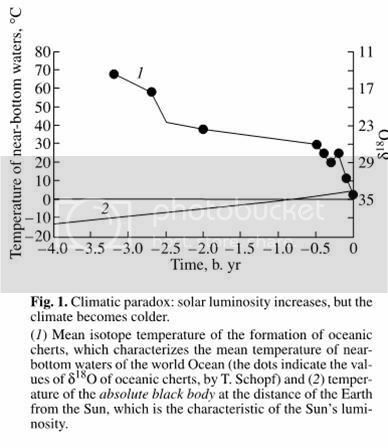 Lindzen (2009) Can thin cirrus clouds in the tropics provide a solution to the faint young sun paradox? (to be submitted to Journal of Geophysical Research). It’s called the “close young moon tidal warming theory”. The Gerstenkorn event was earth’s collision with another planet that led to the creation of the moon. It’s a miracle, I believe… Gore, ooops, God must have had a hand in that. A. was the sun actually 30% cooler say a billion years ago? B. could we tell if it was? B. You mean other than through solid theory of stellar evolution? No. C. We are talking about a forcing which is equivalent to doubling CO2 15 times, and the evidence that the Earth was an ice ball includes the fact that you exist. D. The math doesn’t add up. the rate at which the Earth cools can be computed theoretically. It just wouldn’t be enough. E. Irrelevant but interesting question. Ask somebody who knows a bit more about astronomy. But this business is getting absurd when people try to revise the models of stellar evolution!!! No, some extraterrestrials Species heated up the atmosphere. I made computer simulations and those proved it. I have doubts about this whole GHE/33K alchemy. This paper shows, that Earth and other planets in Sun system enjoy surface temperatures equal to density of their atmosphere and amount of Sun energy reaching it, and it does not matter which gases are their atmospheres composed of. The pure existence of atmosphere (= nitrogen + oxygen) increases our temperature compared to blackbody (or Moon) and buffers day-night fluctuations. Water in form of latent heat carrier and clouds is cooling the earth considerably. Can anybody prove that Moon without atmosphere, with hypothetical 380ppm of CO2 and 4000ppm of water vapor will suddenly became habitably warm? When we go that far back in time there would have been a LOT more radioactive isotopes that have all decayed by now. Would radioactive decay account for a significant part of the heating back then? There are too many variables and unknowns for this to be more than guessing. The sulphate effect would change the Earth’s albedo, by scattering and changing cloudiness. The Earth reflects about 36% of the incoming energy, so if it turned totally black it would only just compensate on its own. (What’s the albedo of lifeless volcanic rock? Just askin’.) The maximum possible greenhouse effect is dependent on where the tropopause is. (Bearing in mind that the greenhouse effect doesn’t work by “trapping” radiation.) If we assume it’s where it is now, then you could get up to 30 C more greenhouse warming by having all outgoing IR emitted from the tropopause altitude. If the atmosphere was thicker back then, you could get more. This has to balance the 30% reduced input, which if we just plug into Stefan-Boltzmann (more assumptions) we get a drop in temperature to 0.7^0.25 * 255 C = 233 C. In other words, we need an additional 20 C from greenhouse warming and reduced albedo (and the list of unknowns). So it doesn’t appear to be impossible on the face of it, but it would require the carbonyl sulphide in a few kilometres thickness of air to be nearly totally opaque across the IR spectrum. Some of the newer research on stellar evolution of metal-rich GV stars like our Sun indicate there is a period at the beginning when they lose more mass and are more luminous than originally thought. This period can last for up to 2 billion years. Secondly, a 30% less luminous Sun does not translate into 30% less solar energy at Earth distance. If you follow the formula through to the end, solar energy at the Earth surface is only about 16% less or enough to drop temperatures by 8.5C (still enough to leave Earth a frozen snowball for most of its history). So either there were more greenhouse gas effects around at the time or the other alternative for stellar evolution is correct. Also note that the continents were not fully formed in the early Earth and a more ocean-covered world would have had lower albedo and fewer times when the continents were at the poles so that large-scale galciers could build up. Still, there have been at least 5 different snowball periods, 2.8 billion, 2.4 billion, 2.2 billion, 710 million and 635 million years ago when the Earth froze over nearly completely. So, there doesn’t need to be really unusual greenhouse gas effects to match the temperature history of Earth – just something a little extra in the very early times. There’s a fly in the ointment. COS (the more common formula for carbonyl sulfide) breaks down spontaneously, and with a fairly high reaction half-rate into hydrogen sulfide and carbon monoxide in the presence of water vapor, catalyzed by both visible and ultraviolet light. Even in the snowball-earth scenario, there would be appreciable water vapor in the thin, chilled troposphere, and much UV in the lowered stratosphere. I don’t think this is the smoking gun Spring Day in Snowsville gas, me hearties. Now, methane, yes. And plenty of sulfur dioxide, yes. But COS, no. I will refrain from commenting on how an atheist deigned to criticize Kelvin’s thermodynamics not on the grounds that it excluded important processes (unknown to both Huxley and Kelvin) but because he couldn’t abide anything which challenged his (whether correct or not) worldview with regard to evolution (something I happen to agree with, to be sure)…. Juraj V. (10:37:53) : Habitable? Sticky term there…warm or not the moon would need a great deal of other things to be habitable (for animals, oxygen for one). Which does not seem widely accepted. I revise my statement to it being equivalent to 8 or less CO2 doublings. However I haven’t checked your math on the temperature difference there so I’m gonna have to figure the implications and see if it accords with other evidence. Meanwhile, I’m still wondering why, at a given latitude and altitude, temperatures are higher where the amount of greenhouse gases are lower. “Habitable” I meant in term of temperatures. Once again, who can prove that Moon with a little bit of water vapor and CO2 will be 33K warmer than it is now, without the atmosphere? Btw, 33K is wrong number, since it calculates blackbody Earth but still with albedo 0,3 – however, this albedo is mainly created by clouds and you can not have Earth without GHG and with clouds at the same time. So more correctly it should be some 15K. “Hollywood Science” again: WATER WINS=6.10 times heat capacity compared with this gore (filthy) gas. OT , but has anyone noticed the latest SOHO images are upside down? 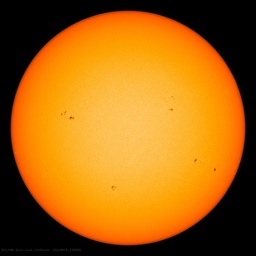 That article was one that I was thinking about but there is more research being done with the “Sun in Time” program where they are undertaking intense surveys of near-by solar analog G0V to G5V stars. Some very unexpected results. This is a presentation of some of the results and there are various papers discussing some of this. Note that luminosity is related to solar radius and temperature while solar irradiance at earth is related to solar radius, temperature and mass (and the distance of the earth to the sun). Putting in all the best estimates for these numbers 4.5 billion years ago still results in 30% less luminosity but not 30% less solar radiation at the earth surface. If you have better numbers, I could use them. here and I thought the early Earth had a totally different atmosphere from that of modern Earth – one with substantial methane, probably lots of co2, and no oxygen. Over time the methane broke up, the co2 was mostly captured by biological and nonbiological processes and the bugs started churning out o2 bigtime. We are now seeing how bad science can infect other disciplines. We now have greenhouse gasses being used to explain every climate fluctuation in all of geological history. I find it difficult to connect all the icehouse planet stuff using the very few outcrops of rocks that are found with suitable lithologies (diamictites). It makes far more sense to me that proterozoic cratons would from time to time be rafted over the poles and then formed glaciers. Explaining Archean planetary processes using extremely altered or metamorphosed rocks is just a bit too dodgey. I have seen 700 Ma old diamictites in the Canadian Rockies and they are much less altered than Archean ones. That being the case, it still takes a pretty good eye and an even better imagination to go from the outcrops I mapped to a glacier, let alone an icesheet or an iceworld. So according to this paper the concentration of carbonyl sulfide must have gone up and down throughout ages since we went from warm to cold to warm to cold on and off and on and of… at nauseam!!! hmmmm, they don’t show this though! deadwood (15:55:38) : Geologists have generally been the first to stand up and object to greenhouse “solutions” to the faint young sun paradox as not supported by the geological record-the concentrations of gases or the particular gases which would have particular effects, just don’t seem like they could have been present in the ancient atmosphere to the degree called for. I mean, bars and bars of CO2? That doesn’t make sense, but that was one of the proposed solutions to the paradox. Hr. Dr. Urey was my lecturer in freshman chemistry at UChicago in 1965. He was out of touch with the student body at the time, though a Nobel Laureate… maybe something like Hr. Dr. Gore? ; I was unqualified at the time to say whether he was out of touch with reality. Thanks for the new insights. That would be a perfect…venusian atmosphere, the perfect environment where to send all those who believe in green house gases. That would be a solvent for all organics. Things were different in our earth. I think Shaviv exaggerated his imagination this time. I believed his theory of the solar system diving in and out of the milky way like a dolphin…until it was recently discovered that we are the passengers of Scorpio nebula which is in angle with respect to the milky way. This is the script of a next movie but nothing to do with our world possible chemistry. (we know what the results aren because we are one of them). Sorry, but this concoction it is not “kosher”. srchuck (16:42:27) : Gore doesn’t have a doctorate. He flunked out of Divinity School, but he doesn’t get to call himself Doctor. WHAT??? You mean positive ice albedo feedback right? Nogw (17:03:06) : You apparently have no clue what Shaviv’s idea was. There is no “diving in and out of the milky way like a dolphin” involved at all. That’s openly hostile, should be snipped, and also, you are painting with a rather broad brush that includes pretty much everybody. I’ve been looking for albedo changes in Earth’s history and I have not found a single estimate for Earth’s albedo during the last ice age or at any time in the past. Not one. I’m prepare to reconstruct it but I would like to have something in the literature to back that up. The ice-albedo feedback is mentioned (something like 1 million times) but nobody has ever put a number to it that I can find. Any links that you have run across? Don’t search for it unless you have a lot of free time – just pass on something you have seen before. It doesn’t take much of a change in albedo to change the temperature by large amounts. Even a change from 0.298 today to 0.35 during the last glacial maximum would keep the CO2 sensitivity number at a low 1.5C per doubling. This looks like a “publish or perish” paper to me. Nothing can be proved or disproved. Probably good for several more follow-ups. Hansen’s number (which is not explained anywhere that I have found) seems much too low to me. This is all generated by a climate model which is based on CO2 doubling at 3.0C. All those glaciers and all that sea ice and all that desert only changes the albedo by 3%? Glaciers down to Chicago and sea ice year-round down to New York versus no glaciers in North America and sea ice in the winter down to Newfoundland only changes the albedo by 3%? That cannot be right. Sorry to be off topic, but does anyone have data files for Mauna Loa Atmospheric Transmission? I can find the dang.png everywhere, but not the actual data to play with. Sulphide and rise of sulphate aerosols taken together would have been responsible for creating snowball earth, the planetwide ice-age hypothesised to have taken place near the end of the Archean eon 2500 million years ago. So they have come up with a theory that might explain a hypothesis. Now here’s a new idea. Suppose there was lots more atmosphere originally. Would that not support giant life-forms a lot more easily? Would not the atmosphere condition be much more like the present oceans which can support the vast life-forms of whales? What could drive the atmosphere off, in this case? Moon ejection or similar (sudden)? Solar wind (gradual)? Have a look at this brilliant piece of work – maybe it can already help you, or maybe George White can answer questions. And BTW I think this piece deserves a post here, with its title “CO2 Forcing: Fact or Fiction” and its stunning (IMHO) use of ice core evidence. Carbon Monoxide is another greenhouse gas to add to the mix! If albedo feedback were true, we would not see the recovery. Also, the relationship between temperature and sea ice is shown to be false: temp’s have NOT changed significantly from 2004-2005, but each summer we see very large sea ice movement (due to winds changing) and every year, a sea ice re-freezing. The notion that we can reconstruct the earth’s climate and other environmental issues, including a detailed composition of a several billion year old atmosphere; sufficiently accurately to explain why the planet then evolved as it (presumably) did; is pretty naive; when you consider, that we have a greatly detailed composition of our present atmosphere; yet we are quite unable to explain the present day climate or what will happen next. But it is one way to consume research grant money. During the Hadean and early Archaean ages, there quite possibly was. I’ve seen estimates of Hadean atmospheric pressure around 1-12 bar. But by the mid-Archaean all the estimates seem to have dropped to close to present atmospheric pressure. And it certainly seems to be by the time life and free oxygen came along. But I don’t know how they know. I think it could be one of those “controversial” areas of knowledge. Venus isn’t in runaway warming. It simply has a larger atmosphere. So, I’ve reconstructed the Earth’s albedo during the last glacial maximum and it comes out to 0.321 versus 0.298 today (Hansen would have used something like 0.307). This estimate is based on the maps of glaciers and sea ice at the last glacial max. versus the latitudal contribution of these areas to global albedo – 80N for example is 0.8% of the Earth’s surface and receives less than half of the solar energy of areas at the equator so 80N only contributes 0.4% to global albedo and so on. That change in albedo would be enough to drop temperatures at the last glacial maximum by -3.6C from today with the drop in CO2 to 180 ppm contributing another -1.1C (assuming 1.5C per doubling) (and using the stefan boltzmann equations properly which Hansen clearly has not done). Surprising the impacts are not far off of Hansen’s net numbers but he is using 0.75C per watt which means he is just making up the forcing numbers to balance off to the temp C response per watt he wants to use – he used these forcing to say he “nailed” the 0.75C per watt when it is clear he started with that assumption and just made up the other numbers – interesting). So let’s say my 0.321 albedo is right = 1366*(1-0.321)/4 = 231 watts/metre^2 or -9.0 watts * 0.75C per watt = -6.75C (in other words at some point in time, Hansen locked himself into the 0.75C and he can’t get out now). It isn’t now (fairly stable at 400 degrees), hence my use of past tense, but it’s generally accepted it experienced runaway warming at some point earlier, in which it rapidly warmed past the point where the oceans evaporated. Also, Venus’s amosphere is so dense mostly because there is nothing to remove carbon from the atmosphere. If you took out the CO2 from Venus’ atmosphere and made it a trace gas like here on Earth you would decrease its mass by 95%. It would still be thicker than Earth’s, but not by nearly as much. But at lower latitudes i think it could be a significant factor. The CO2 in Venus’ atmosphere does not explain its surface temperature. The surface temperature is about 709K and solar energy and the greenhouse impact of the atmosphere can only explain about 309K. (I guess one could use 45C per doubling but that sounds a little unrealistic when Earth’s is only 1.5C to 3.0C per doubling and it has more initial solar energy to start with). So, there is 400K missing – there is no candidate for what is causing this extra 400K other than atmospheric pressure – obviously, it is time to bring the “Gas Laws” into the climate equations. Surface Temp = Solar Forcing + Greenhouse Forcing + Atmospheric Pressure/Gravitational Compression Forcing. That was the idea I think with having bars and bars of CO2 in the early Earth’s atmosphere to “solve” the faint young sun paradox. Doesn’t work on Earth, but Venus it might. And if you do the math for 280 ppm in halvings (the opposite of doubling), there is only 11 halvings to get to effectively Zero. If you assume 3.0C per doubling, then 11 halvings produces a ZeroC greenhouse effect (and the doubling value cannot be more than 3.0C – actually 3.2C is the accurate complete number). That would mean GHGs/CO2 is responsible for the entire greenhouse effect by also controlling 100% of the water vapour as well. Probably not true. If you assume 1.5C per doubling, take away all the non-water-GHGs and you still have 16.5C left to explain. – atmospheric pressure contains latent heat. Now temperatures do rise as pressure increases everywhere in the universe. The centre of the stars do not initiate fusion until the pressure and temperature inside builds to millions of degrees. The centre of Jupiter is 10,000K even though not a single photon of solar energy gets down there and there are no greenhouse gases – hydrogen and helium are not greenhouse gases? Venus is 400K hotter than it should be. The centre of the Earth is 5700K. There are “Gas Laws” that says pressure = heat so I don’t know why that is ignored. What relevance does this have to a modern atmosphere? I don’t think that the molecule would be stable in the presence of oxygen, for example. Certainly, if Lovelock’s model of a self-regulating climate is correct, temperature has been regulated by life balancing out some of those factors under life’s control to keep the climate mostly stable, with only a few exceptions, over a couple of billion years. One of the inputs to that system is of course a greenhouse effect, of greater or lesser extent through time. You’re implying that greenhouse effects are good, so that it is impossible for them to hurt us? Water is good too, but it’s certainly possible to drown in it. And compared to the slow ripples our climate system and biology are adapted to dealing with, our geologically instantaneous increase in CO2 and especially methane is coming at us like a vertical wall, moving a thousand miles an hour. Oh, and the theory also explains the excess energy from Jupiter as well. AND provides the “trigger” to get the sun started. Basically the guy posits that U was present in enough abundance to form a lump in the center of the sun to make a fission trigger; in the center of Jupiter enough to explain it’s excess energy for 4+ Billion years; and in the center of the earth enough to explain our warmth and vulcanism for 4+ billion years. By irradiating sulphur dioxide with different wavelengths of sunlight, they observed that sunlight passing through Carbonyl Sulphide gave them the wavelengths that produced the weird isotope mix. I still don’t get it. Sunshine filtered by Carbonyl Sulphide gives a wavelength that produces isotope mixes? It has to be some kind of isotopic separation via reaction catalysis or something other than “produced the weird isotope mix” directly. Well, at least it goes up and down at the right times: I’m convinced that orbit perturbations influence ice ages, but the ice ages themselves seem to come “too fast” […] But what “tips” to cause 4000 feet of ice to cover Indiana, Illinois, and all of North and South Dakota, Michigan, Minnesota, and most of Canada? 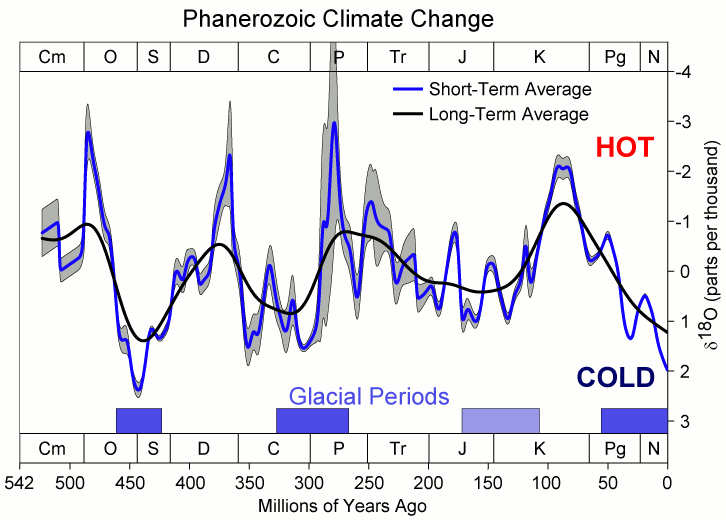 Which explains the ice-epochs, then Milankovitch explains the glacial / interglacial pattern within the ice-epoch. What’s a “GV” star? It’s been a while since I had the “Geology of the Solar System” class (it was way cool and covered stellar evolution) and I may have forgotten the acronym or?… We’re just a regular old 1 Solar Mass main sequence star, no? Secondly, a 30% less luminous Sun does not translate into 30% less solar energy at Earth distance. And if I remember correctly, some folks were still arguing over the potential for the planets to have wandered a bit in their orbits since formation (something about the gas giants maybe migrating outward?) Do we really know exactly what distance earth orbited at 4 billion years ago? The moon is drifting outward, and I thought some of the planets had wandered further out too? No? deadwood (15:55:38) : We are now seeing how bad science can infect other disciplines. We now have greenhouse gasses being used to explain every climate fluctuation in all of geological history. I must dig out my old book of Mr. Mark Twain and read him again. Such a finely honed and tidy mind… A more suitable stone for sharpening ones wit a whit is not to be found. Yeah. We don’t “dive in and out” of the spiral arms, they are compression artifacts, more like the stop and go of cars in a traffic jam, causes by the changes of gravity as things bunch up and spread out. Oh, and while the two galaxies are merging, turns out we really are from The Milky Way – the story that we were the space aliens caught me too, but it isn’t correct. Lucy Skywalker (02:34:27) : Now here’s a new idea. Suppose there was lots more atmosphere originally. Would that not support giant life-forms a lot more easily? Would not the atmosphere condition be much more like the present oceans which can support the vast life-forms of whales? What could drive the atmosphere off, in this case? Moon ejection or similar (sudden)? Solar wind (gradual)? Or more prosaic: It didn’t leave. Take a look at the mass of the banded iron formations (postulated to be from the removal from the atmosphere of O2) and the global carbonate rock deposits (postulated to be from CO2 scrubbing via the ocean). At any rate, pick a place on the planet and you are likely to find many meters thick layers of some carbonate or another somewhere nearby. Heck, even the Himalaya have sea shell deposits (as do the sediments in the Sierra Nevada), most of Florida is carbonate, the Karst deposits of the Southeast too, even the land that the Grand Canyon is cut through has shells in the sandstone. So put all that carbonate into the air as CO2 (assuming in a very not newly formed world carbonates are not stable) and you get a pretty thick atmosphere. I’m not sure I trust Wikipedia on anything to do with the greenhouse effect. I would, in any case, like more detail on this argument, because it doesn’t fit together for me yet. The temperature on the surface of Venus is a combination of an average altitude of emission to space about 50 km up, (due to a high-level tropopause and thick clouds above it) and an 8 C/km adiabatic lapse rate, giving a cloud-surface temperature difference of roughly 400 C. The main difference between our atmospheres is that on Earth the CO2 was locked away in carbonate rocks by plate tectonics, and fairly obviously wasn’t on Venus (or at least not permanently) because it’s currently free. Why is a ‘runaway greenhouse’ from boiling oceans required to explain this? It is true that if there were ever oceans on Venus, they must have boiled at some point, and something must have caused the rising temperature and thickening atmosphere, but how can anyone tell what it was? Shrug. I’ll tell you what I always tell people in these situations: don’t trust Wikipedia, trust the cites. It’s not really warmenist-friendly. The main difference between our atmospheres is that on Earth the CO2 was locked away in carbonate rocks by plate tectonics, and fairly obviously wasn’t on Venus (or at least not permanently) because it’s currently free. Exactly. This is why it’s a bit inexact to say Venus simply has a bigger atmosphere: most of that is carbon, which we have a similar amount of here. Why is a ‘runaway greenhouse’ from boiling oceans required to explain this? Because, as I understand it, lack of plate tectonics isn’t enough to explain how all that carbon ended up in the Venusian atmosphere. There is also a sublimation reaction at high temperatures that pulls CO2 out. There’s been some talk it might someday be possible to cool Venus back to its primordial state. If we can block some percentage of the radiation it receives so it cools a bit, we could introduce some hardy engineered microbes to lock that carbon back into the ground and get some oxygen going, eventually making the place habitable for humans. Agreed, the fact that venus has 243 earth day, days, no magnetic field to speak of, slightly less mass etc, its not really comparing apples with apples. Thanks for the pointing out the paper, it clarifies a few issues, but I still have some questions about it. The calculation seems based on the ideas around figure 7. The outgoing IR and net incoming solar fluxes at the top of the atmosphere are calculated assuming a solar constant of 1360 W/m^2 for various surface temperatures. They then effectively ask what you have to multiply the solar flux by to get it to balance the IR flux, and assert that this is the solar constant that would yield that temperature. The problem is, I think that increasing the solar constant would increase the outgoing IR flux too. The problem is, they’re a bit skimpy on the details of how they calculated it, so I can’t tell. They say that the reason the IR out approaches a constant 310 W/m^2 as temperature rises is that the moist convective atmosphere becomes thick enough to be totally opaque to IR, so the emission to space is unchanged by additional thickness of the layer. Agreed. But I would expect that this limit is going to be determined by the heat out approaching balance with the heat in. They use 1360 W/m^2 as the solar constant, which you can divide by 4 to get the average over a sphere, giving 340 W/m^2. I’m not sure why there’s a 10% difference here, but I strongly suspect that with some adjustments this is the basic origin of this number. The net solar flux is essentially this same number reduced by the albedo, so the ratio of the two winds up being close to 1/(1-albedo), about 1.4. Their ‘runaway’ greenhouse effect comes down to an assertion that a hot moist planet cannot lose heat faster than 310 W/m^2, so once the heat input exceeds this the temperature rockets up uncontrollably. (Note, not by positive feedback.) It’s only when the blackbody radiation from the surface gets into the visible part of the spectrum that it can start losing more heat again. So what I want to know is where the 310 W/m^2 figure comes from, and why does it not change as the solar constant is increased?